RIR asked the organizers of the Sochi Olympics Opening Ceremony and the spectators at the Fisht Stadium to share their impressions. The Opening Ceremony of the 2014 Sochi Winter Olympic Games took place at 20:14 on February 7 in the Fisht Olympic Stadium. It was witnessed by more than 3 billion viewers worldwide. Details of the show, entitled “Dreams of Russia" were kept a secret until the very last moments, even though Olympic volunteers had seen dress rehearsals throughout the past week. The spectacle involved 12,000 people of 17 nationalities. The Fisht Stadium, named for one of the most famous peaks of the Caucasus mountain range, is impressive not only because of its size, but also because of its unique design. At night, lit with a blue backlight, the building resembles a mountain. 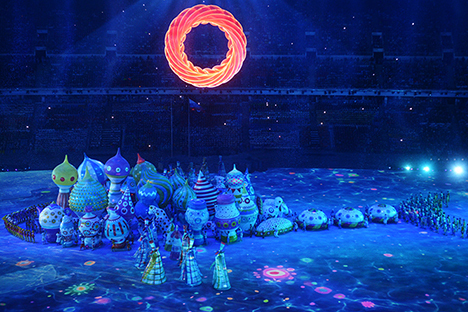 The 40,000 spectators who attended the Opening Ceremonies here witnessed a multimedia show intended to tell the world about Russia – its culture, history, traditions and inhabitants. In her travels, the little heroine journeys though many regions of Russia, witnesses major events in the history of Russia and meets with legendary personalities. Some of her experiences include a troika of huge sparkling horses, an Orthodox Church, the first warships of Peter the Great, the founding of St. Petersburg and the legendary Russian ballet. She witnesses the Soviet era through the appearance of the famous statue of the Worker and Collective Farm woman. Trains and huge metal structures reminded spectators of the tremendous technological advances in those years. The Soviet automobile industry, the “stilyagi” dandies of the 50s, the Khrushchev thaw, the song from the movie ‘Moscow Does Not Believe in Tears’ - in short, for a Russian this was something to remember and something that brought an element of nostalgia. But how clear were all these “signs of the times” to foreign visitors? Details of the Closing Ceremony of the Games will be kept secret until February 23.